Though there's not much time to linger on it in the movie, one of the best parts of reading The Hunger Games is the descriptions of food, particularly the lavish meals Katniss encounters when she arrives in the Capitol. One of the best, and Katniss's favorite, is a stew of lamb and plums that she devours to build up her strength before the Games, and cites to Caesar Flickerman as the thing she likes best about the Capitol. The stew doesn't make it into the movie-- tragedy!-- but thanks to our own Amy DeLine, you can recreate it for yourself at home after seeing The Hunger Games this weekend. 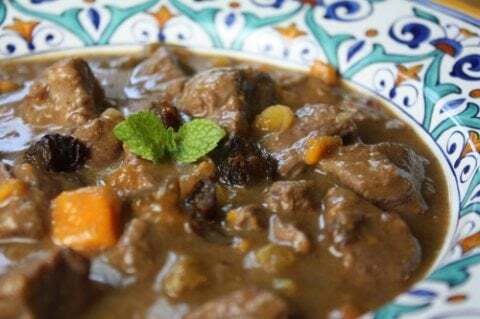 Over at her food blog The Gourmand Mom, Amy posted a recipe for Moroccan-Style Lamb Stew with Dried Plums, making a hearty and gorgeous-looking dish with the exotic flavors you imagine they favor in the Capitol. Click on the photo of the lamb dish below to see the full recipe, or get a taste of what she's bringing to the table with this excerpt from her post below. If you're a little turned off by the idea of putting prunes in the stew, so was Amy-- but as it turns out, we all should trust Katniss's taste in this one. With The Hunger Games poised to premiere in just a few days, a celebratory lamb stew seemed in order. But, to be quite honest, I wasn’t so sure how I felt about adding dried plums (prunes essentially) to my lamb stew. Am I the only one who’s afraid of prunes?? Trepidations aside, I decided to go for it. I figure that if Katniss can volunteer as tribute to save her sister’s life, I can certainly put a few prunes in my stew. For good measure, I also threw in some golden raisins, dried apricots and sweet potatoes. Moroccan-inspired spices of cinnamon, ginger, cumin, and fresh mint complete the flavor profile in this decadent, slow-cooked lamb stew. Somehow I suspect that Katniss’ favorite lamb stew would have been equally exotic. And as for the dried plums…I was so wrong. They are spectacular in combination with the tender chunks of slow-cooked lamb and Moroccan-inspired spices. I can’t think of a better pre-Hunger Games meal. As Katniss would say, I could eat this by the bucketful!